Great family day out today! Pakistan is playing a three day friendly 'practice' match against New Zealand at the moment. 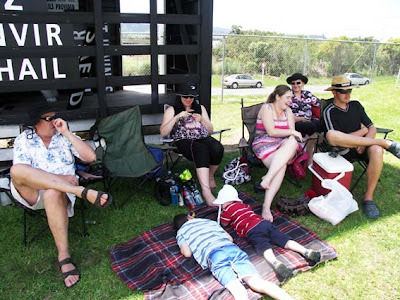 It's all very informal and the only bit of shade my family could find was right in front of the scoreboard. I was grateful for that shade! It was a very pleasant way to spend a few hours! A few months ago she sent out a challenge - daring us to go public with our 'uncool' crafts. If you think about it, when last did you see someone younger than 65 knitting? Or crocheting? I think it's a great challenge - why should knitting or crocheting be considered uncool? This was as public as I could get. A funny side note: Aunty Sherri was complaining of being bored - I offered to teach her to crochet - she told me she wasn't THAT bored! I had to giggle at that! Seriously though, let's revive crafting. I dare you to have a photo taken of you doing what you love to do and upload it here! And I already thought that crafting was cool! Hahaha - you go girl! 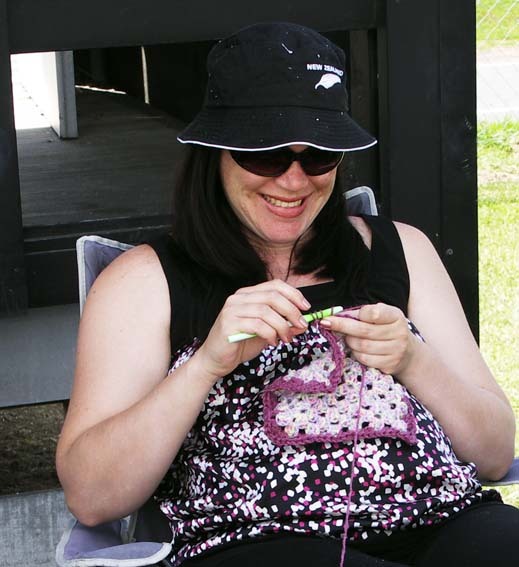 I just had some pics taken today of me crafting in public too!!! p.s. hope you don't mind me stealing your photo for my post today? @Carol - crafting is cool in my eyes! and.. @PaisleyJade I don't mind at all, thanks for linking back to me! That strange oversized granny square has become a 'carseat blanket' (in kiwispeak: 'capsule blanket') - it matches a beanie I crocheted for Miss Piggy.